Here you go with a maggi-style Indonesian Noodles with half-fried on top!!! Boil noodles along with green peas and carrots in plenty of water until they are 80-90% cooked. Drain excess water and keep aside. Heat 2 tsp oil in deep vessel and add sliced mushrooms. Saute it for a few seconds. Add noodles, green peas, carrots in it along with sauces n spices and toss everything well on high heat. Heat 1 tsp oil in a sauce pan and break an egg in it. Sprinkle salt and a pinch of black pepper powder and half-fry for 2-3 mins. Place it on top of noodles. 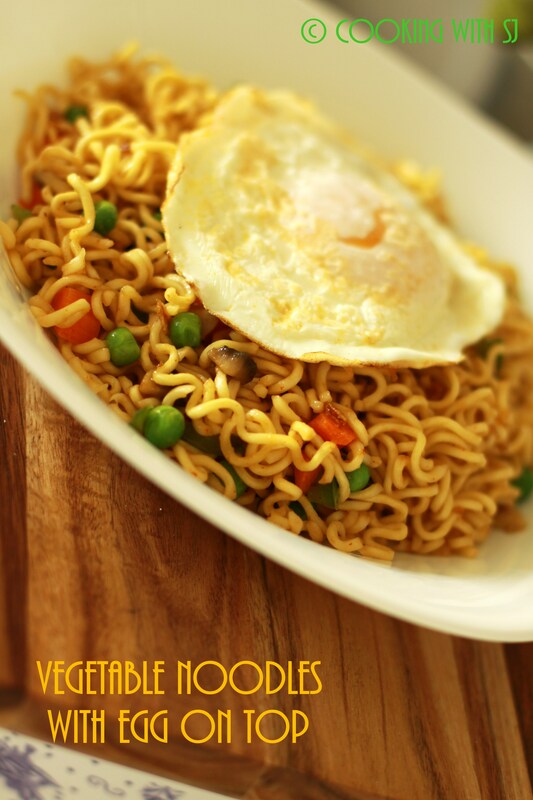 Your blog is good and you are sharing the right tips to cook delicious and tasty Maggi Noodles. Thank for great post.